One of the major trial and tribulations of river towns were floods. East Liverpool did not escape that problem. One plus is that the hills of East Liverpool did help to minimize the over all damages of those floods. 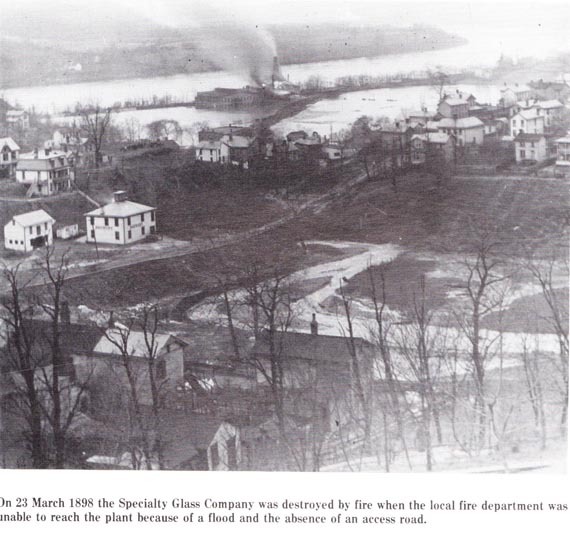 - East Liverpool has suffered at intervals since its settlement by devastating floods which have been particularly damaging to plants and residences fronting the Ohio River. The first of these occurred in 1832 when the city was a struggling village. In 1852 an even greater loss was had. Then the initial pottery of the locality was practically ruined, that of the Bennett Brothers. The Harker plant also was badly damaged as well as others along the stream. Another freshet of a destructive nature followed in 1865 but it did not reach the dimensions of that of thirteen years previously. The great flood of 1884, however, practically surpassed all others in its extent and destructive qualities. For miles above and below it the land alongside the city was inundated. Houses, rafts, lumber, debris of all kinds were sept down the turbulent stream. Factories had to be shut down. The water pumps would not operate. For the first time since its construction the Cleveland & Pittsburg railway between Pittsburg and Wellsville suspended operations. The high water mark was reached on February 7. The damage ran into thousands of dollars. Food relief was attempted by sending out a little packet streamer from Pittsburg to persons marooned in the upper sections of houses whose lower floors were filled with water but they in many instances fearing the was of the waves from its wheel would destroy their homes fired at the boat. Its pilot house was accordingly riddled with bullets. Organized relief finally followed. A boat from Pittsburg under the direction of Rev. E. R. Donahoo, pastor of the West End Presbyterian Church of Pittsburg, was able to lend needed aid to the unfortunates between the Smoky City and Steubenville. 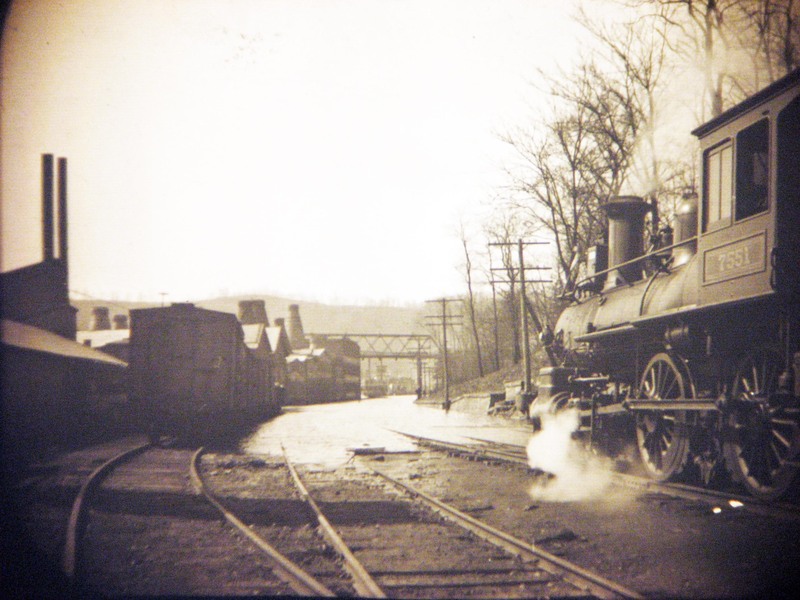 On March 27-30, 1913, a flood almost the extent of that of 1884 caused a suspension of railway activities into East Liverpool. For two days the city was entirely without railway and mail connection from the outside world. The wharfboat floated over the C. & P. tracks at the foot of Broadway. 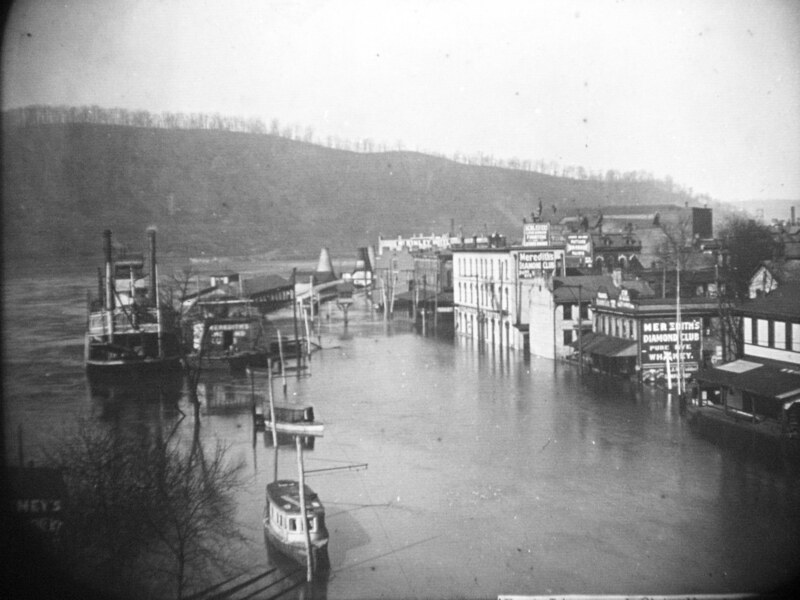 The city of Parkersburg, which barely was able to pass under the Chester, W. Va., bridge at the outset of the rapid rise in the river was alongside and held in place by being tied to telephone poles. The water extended across a portion of Second Street, and reached the tops of the picket fence between the tacks at the C. & P. depot. The loss to river potteries and residents along the stream totaled thousands of dollars. In the Spring of 1907 a flood of considerable dimensions occurred, the then river line of street cars being unable to function as water covered a portion of the tracks. Trains were also delayed for several hours at that time also. Twice within a month in 1908 two serious floods occurred in the Ohio River, both holding on for about two days each. The first of these was in the middle of February and the second about the same time in March. The river potteries were then reached. Much inconvenience resulted in the transfer of material to the top floors. The old pumping station near Harker's pottery was kept running on both occasions though water covered its floor to a depth of four feet. Stagings were built above the flood stage, which enabled activity. Two boilers that had been permanently raised for such an eventuality enabled the plant to function though valves had to be operated under water. An unusual rise in the river in January of 1882 destroyed gardens from which vegetables had about matured. A similar flood in 1924 covered the then West End Park and destroyed almost entirely all crops in the Aten gardens on the north of the C. & P. tracks as well as that on the strip alongside the river on the south of the railroad. We are fortunate enough to have some pictures of the major floods that occurred in 1884, 1898, 1907, 1936, and 1943. 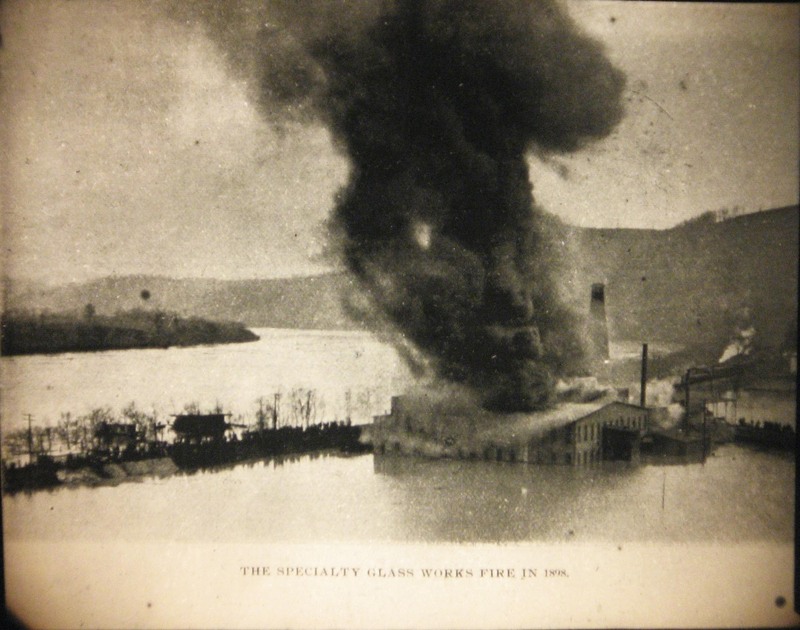 Glass House works fire, flood of 1898. Speciality Glass (works) Company in west end near the stadium at Patterson Field. Another view of the C.C. Thompson Pottery closed as a result of one of the various floods that occurred in those days. Train stopped behind the C. C. Thompson Pottery because of flooded tracks. Chester Bridge is visible in the distance. Railroad crossing at Second Street and Broadway. Chester Bridge in background, along with the railroad watchmen's tower. 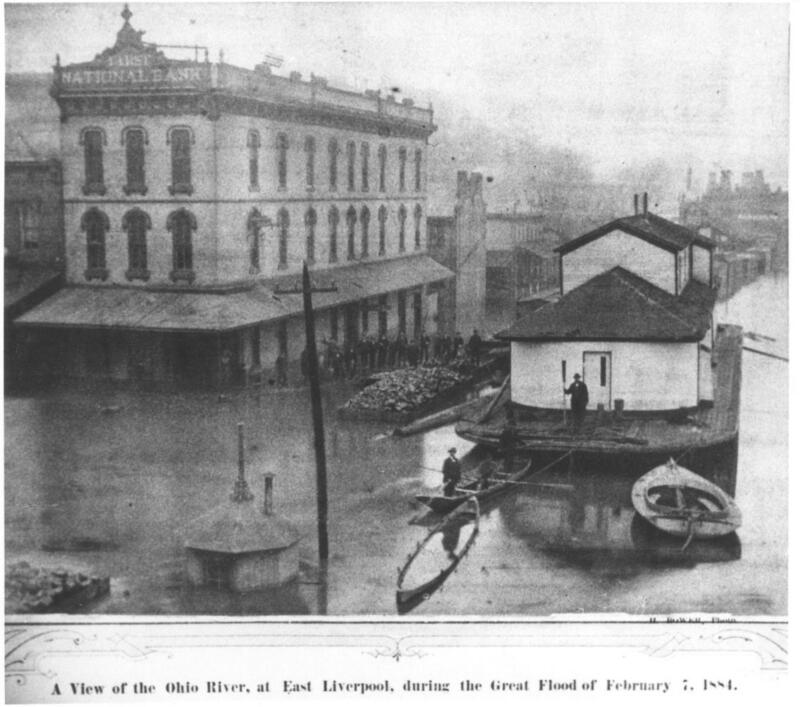 The Flood of 1907. Second street looking west and the river front along the railroad tracks. "first street" area.